Bruxism is excessive teeth grinding or jaw clenching. It is an oral parafunctional activity; i.e., it is unrelated to normal function such as eating or talking. Bruxism is a common problem; reports of prevalence range from 8–31% in the general population. Several symptoms are commonly associated with bruxism, including hypersensitive teeth, aching jaw muscles, headaches, tooth wear, damage to dental restorations (e.g. crowns and fillings) and damage to teeth. However it may cause minimal symptoms, and therefore people may not be aware of the condition. There are two main types of bruxism: that which occurs during sleep (sleep bruxism) and that which occurs during wakefulness (awake bruxism). Dental damage may be similar in both types, but the symptoms of sleep bruxism tend to be worse on waking and improve during the course of the day, and the symptoms of awake bruxism may not be present at all on waking, and then worsen over the day. The causes of bruxism are not completely understood, but probably involve multiple factors. Awake bruxism is thought to have different causes from sleep bruxism, and is more common in females, whereas males and females are affected in equal proportions by sleep bruxism. Several treatments are in use, although there is little evidence of robust efficacy for any particular treatment. Most people with bruxism will not experience any pain. Furthermore, the presence or degree of pain does not necessarily correlate with the severity of grinding or clenching that is occurring. The pain in the muscles of mastication caused by bruxism can be likened to muscle pain that occurs after exercise. 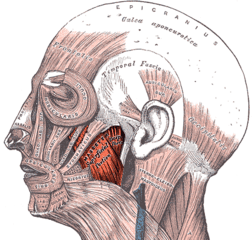 The pain may be felt over the angle of the jaw (masseter) or in the temple (temporalis), and may be described as a headache or an aching jaw. 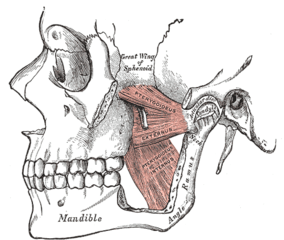 Most (but not all) bruxism includes clenching force provided by masseter and temporalis muscle groups; but some bruxers clench and grind front teeth only, which involves minimal action of the masseter and temporalis muscles. The temporomandibular joints themselves may also become painful, which is usually felt just in front of the ear, or inside the ear itself. Clicking of the jaw joint may also develop. The forces exerted on the teeth are more than the periodontal ligament is biologically designed to handle, and so inflammation may result. A tooth may become sore to bite on, and further, tooth wear may reduce the insulating width of enamel and dentin that protects the pulp of the tooth and result in hypersensitivity, e.g. to cold stimuli. The relationship of bruxism with temporomandibular joint dysfunction (TMD, or temporomandibular pain dysfunction syndrome) is debated. Many suggest that sleep bruxism can be a causative or contributory factor to pain symptoms in TMD. Indeed, the symptoms of TMD overlap with those of bruxism. Others suggest that there is no strong association between TMD and bruxism. A systematic review investigating the possible relationship concluded that when self-reported bruxism is used to diagnose bruxism, there is a positive association with TMD pain, and when stricter diagnostic criteria for bruxism are used, the association with TMD symptoms is much lower. In severe, chronic cases, bruxism can lead to myofascial pain and arthritis of the temporomandibular joints. Occlusion is defined most simply as "contacts between teeth", and refers to the meeting of teeth during biting and chewing. The term does not imply any disease. Malocclusion is a medical term referring to less than ideal positioning of the upper teeth relative to the lower teeth, which can occur both when the upper jaw is ideally proportioned to the lower jaw, or where there is a discrepancy between the size of the upper jaw relative to the lower jaw. Malocclusion of some sort is so common that the concept of an "ideal occlusion" is called into question, and it can be considered "normal to be abnormal". An occlusal interference may refer to a problem which interferes with the normal path of the bite, and is usually used to describe a localized problem with the position or shape of a single tooth or group of teeth. A premature contact is a term that refers to one part of the bite meeting sooner than other parts, meaning that the rest of the teeth meet later or are held open, e.g., a new dental restoration on a tooth (e.g., a crown) which has a slightly different shape or position to the original tooth may contact too soon in the bite. A deflective interference refers to an interference with the bite that changes the normal path of the bite. A common example of a deflective is an over-erupted upper wisdom tooth, often because the lower wisdom tooth has been removed or is impacted. In this example, when the jaws are brought together, the lower back teeth contact the prominent wisdom tooth before the other teeth, and the lower jaw has to move forward to get the rest of the teeth to meet. The difference between a premature contact and a deflective interference is that the latter implies a dynamic abnormality in the bite. "Bruxism is a repetitive jaw-muscle activity characterized by clenching or grinding of the teeth and/or by bracing or thrusting of the mandible. 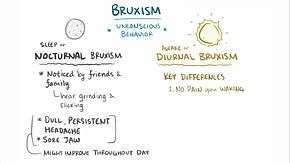 Bruxism has two distinct circadian manifestations: it can occur during sleep (indicated as sleep bruxism) or during wakefulness (indicated as awake bruxism)"
Occlusal splints (also termed dental guards) are commonly prescribed, mainly by dentists and dental specialists, as a treatment for bruxism. Proponents of their use claim many benefits, however when the evidence is critically examined in systematic reviews of the topic, it is reported that there is insufficient evidence to show that occlusal splints are effective for sleep bruxism. Furthermore, occlusal splints are probably ineffective for awake bruxism, since they tend to be worn only during sleep. However, occlusal splints may be of some benefit in reducing the tooth wear that may accompany bruxism, but by mechanically protecting the teeth rather than reducing the bruxing activity itself. In a minority of cases, sleep bruxism may be made worse by an occlusal splint. Some patients will periodically return with splints with holes worn through them, either because the bruxism is aggravated, or unaffected by the presence of the splint. When tooth-to-tooth contact is possible through the holes in a splint, it is offering no protection against tooth wear and needs to be replaced. A repositioning splint is designed to change the patient's occlusion, or bite. The efficacy of such devices is debated. Some writers propose that irreversible complications can result from the long-term use of mouthguards and repositioning splints. Random controlled trials with these type devices generally show no benefit over other therapies. Another partial splint is the nociceptive trigeminal inhibition tension suppression system (NTI-TSS) dental guard. This splint snaps onto the upper front teeth only. It is theorized to prevent tissue damages primarily by reducing the bite force from attempts to close the jaw normally into a forward twisting of the lower front teeth. The intent is for the brain to interpret the nerve sensations as undesirable, automatically and subconsciously reducing clenching force. However, there may be potential for the NTI-TSS device to act as a Dahl appliance, holding the posterior teeth out of occlusion and leading to their over-eruption, deranging the occlusion (i.e. it may cause the teeth to move position). Hence, ongoing follow-ups are recommended. Many different medications have been used to treat bruxism, including benzodiazepines, anticonvulsants, beta blockers, dopamine agents, antidepressants, muscle relaxants, and others. However, there is little, if any, evidence for their respective and comparative efficacies with each other and when compared to a placebo. A systematic review is underway to investigate the evidence for drug treatments in sleep bruxism. Biofeedback refers to a process (or device that enables such a process) that allows an individual to become aware of, and alter physiological activity with the aim of improving health. There is no evidence for the long term use and safety of biofeedback in the management of bruxism. Electromyographic monitoring of the muscles with automatic alerting during periods of clenching and grinding has been prescribed for awake bruxism. Dental appliances with capsules that break and release a taste stimulus when enough force is applied have also been described in sleep bruxism, which would wake the person from sleep in an attempt to prevent bruxism episodes. Unfortunately this resulted in excessive daytime sleepiness. Clenching the teeth is generally displayed by humans and other animals as a display of anger, hostility or frustration. It is thought that in humans, clenching the teeth may be an evolutionary instinct to display teeth as weapons, thereby threatening a rival or a predator. The phrase "to grit one's teeth" refers to grinding or clenching of the teeth in anger, or to accept a difficult or unpleasant situation and deal with it in a determined way. In the Bible there are several references to "gnashing of teeth" in both the Old Testament, and the New Testament particularly, where the phrase "wailing and gnashing of teeth" is used to describe the fate of sinners in hell (Matthew 22:13). In rave culture, recreational use of ecstasy causes many health problems, and bruxism is often reported by users. Among people who have taken ecstasy, while dancing it is common to use pacifiers, lollipops or chewing gum in an attempt to reduce the damage to the teeth and to prevent jaw pain. Bruxism is thought to be one of the contributing factors in "meth mouth", a condition potentially associated with long term methamphetamine use. 1 2 3 4 5 6 7 8 9 10 11 12 13 14 15 16 17 Wassell R, Naru A, Steele J, Nohl F (2008). Applied occlusion. London: Quintessence. pp. 26–30. ISBN 9781850970989. 1 2 3 Manfredini D, Winocur E, Guarda-Nardini L, Paesani D, Lobbezoo F (2013). "Epidemiology of bruxism in adults: a systematic review of the literature". Journal of Orofacial Pain. 27 (2): 99–110. doi:10.11607/jop.921. PMID 23630682. 1 2 3 4 Tyldesley WR, Field A, Longman L (2003). Tyldesley's Oral medicine (5th ed.). Oxford: Oxford University Press. p. 195. ISBN 0192631470. 1 2 3 4 5 6 7 8 9 10 11 12 13 14 15 16 17 Cawson RA, Odell EW, Porter S (2002). Cawsonś essentials of oral pathology and oral medicine. (7th ed.). Edinburgh: Churchill Livingstone. pp. 6,566,364,366. ISBN 0443071063. 1 2 3 4 5 6 7 8 9 10 11 12 13 14 15 16 17 18 19 20 21 22 23 24 25 26 27 28 29 30 31 32 33 34 35 36 37 Shetty S, Pitti V, Satish Babu CL, Surendra Kumar GP, Deepthi BC (September 2010). "Bruxism: a literature review". Journal of Indian Prosthodontic Society. 10 (3): 141–8. doi:10.1007/s13191-011-0041-5. PMC 3081266 . PMID 21886404. 1 2 3 Lobbezoo F, van der Zaag J, van Selms MK, Hamburger HL, Naeije M (July 2008). "Principles for the management of bruxism". Journal of Oral Rehabilitation. 35 (7): 509–23. doi:10.1111/j.1365-2842.2008.01853.x. PMID 18557917. 1 2 3 4 5 6 7 8 Scully, Crispian (2008). Oral and maxillofacial medicine : the basis of diagnosis and treatment (2nd ed.). Edinburgh: Churchill Livingstone. pp. 291, 292, 343, 353, 359, 382. ISBN 9780443068188. 1 2 3 4 5 Heasman P (editor) (2008). Master Dentistry Vol I: Restorative dentistry, paediatric dentistry and orthodontics (2nd ed.). Edinburgh: Churchill Livingstone. p. 177. ISBN 9780443068959. 1 2 3 4 Neville BW, Damm DD, Allen CA, Bouquot JE (2002). Oral & maxillofacial pathology (2nd ed.). Philadelphia: W.B. Saunders. pp. 21,58,59,173. ISBN 0721690033. 1 2 3 4 5 6 7 8 9 10 11 12 13 14 15 16 17 18 19 20 21 22 23 24 25 26 27 28 Macedo, Cristiane R; Machado MAC; Silva AB; Prado GF (21 January 2009). "Pharmacotherapy for sleep bruxism". Cochrane Database of Systematic Reviews. John Wiley & Sons, Ltd. doi:10.1002/14651858.CD005578. 1 2 Kalantzis A, Scully C (2005). Oxford handbook of dental patient care, the essential guide to hospital dentistry. (2nd ed.). New York: Oxford University Press. p. 332. ISBN 9780198566236. 1 2 3 "Bruxism". United States National Library of Medicine. 28 April 2008. Retrieved 2009-06-11. ↑ Pettengill CA (April 2011). "Interaction of dental erosion and bruxism: the amplification of tooth wear". Journal of the California Dental Association. 39 (4): 251–6. PMID 21675679. 1 2 3 Davies SJ, Gray RJ, Linden GJ, James JA (December 2001). "Occlusal considerations in periodontics". British Dental Journal. 191 (11): 597–604. doi:10.1038/sj.bdj.4801245a. PMID 11770945. 1 2 3 4 5 Greenberg MS, Glick M (2003). Burket's oral medicine diagnosis & treatment (10th ed.). Hamilton, Ont. : BC Decker. pp. 87,88,90–93,101–105. ISBN 1550091867. ↑ De Meyer MD, De Boever JA (1997). "[The role of bruxism in the appearance of temporomandibular joint disorders]". Revue Belge De Médecine Dentaire (in French). 52 (4): 124–38. PMID 9709800. ↑ Manfredini D, Lobbezoo F (June 2010). "Relationship between bruxism and temporomandibular disorders: a systematic review of literature from 1998 to 2008". Oral Surgery, Oral Medicine, Oral Pathology, Oral Radiology, and Endodontics. 109 (6): e26–50. doi:10.1016/j.tripleo.2010.02.013. PMID 20451831. ↑ Kato T, Thie NM, Huynh N, Miyawaki S, Lavigne GJ (2003). "Topical review: sleep bruxism and the role of peripheral sensory influences". Journal of Orofacial Pain. 17 (3): 191–213. PMID 14520766. ↑ Lobbezoo F, Naeije M (December 2001). "Bruxism is mainly regulated centrally, not peripherally". Journal of Oral Rehabilitation. 28 (12): 1085–91. doi:10.1046/j.1365-2842.2001.00839.x. PMID 11874505. 1 2 3 4 5 "Bruxism/Teeth grinding". Mayo Foundation for Medical Education and Research. 19 May 2009. Retrieved 2009-06-11. 1 2 3 Manfredini D, Lobbezoo F (2009). "Role of psychosocial factors in the etiology of bruxism". Journal of Orofacial Pain. 23 (2): 153–66. PMID 19492540. 1 2 Lavigne GJ, Huynh N, Kato T, et al. (April 2007). "Genesis of sleep bruxism: motor and autonomic-cardiac interactions". Archives of Oral Biology. 52 (4): 381–4. doi:10.1016/j.archoralbio.2006.11.017. PMID 17313939. 1 2 3 4 5 6 7 8 9 10 11 12 13 14 15 16 17 18 19 20 21 Lobbezoo F, Van Der Zaag J, Naeije M (April 2006). "Bruxism: its multiple causes and its effects on dental implants - an updated review". Journal of Oral Rehabilitation. 33 (4): 293–300. doi:10.1111/j.1365-2842.2006.01609.x. PMID 16629884. ↑ Poveda Roda R, Bagan JV, Díaz Fernández JM, Hernández Bazán S, Jiménez Soriano Y (August 2007). "Review of temporomandibular joint pathology. Part I: classification, epidemiology and risk factors" (PDF). Medicina Oral, Patología Oral Y Cirugía Bucal. 12 (4): E292–8. PMID 17664915. 1 2 3 4 5 Macedo CR, Silva AB, Machado MA, Saconato H, Prado GF (2007). "Occlusal splints for treating sleep bruxism (tooth grinding)". The Cochrane Database of Systematic Reviews (4): CD005514. doi:10.1002/14651858.CD005514.pub2. PMID 17943862. 1 2 3 4 5 6 7 8 9 10 11 12 13 14 15 16 17 18 19 20 "International classification of sleep disorders, revised: Diagnostic and coding manual." (PDF). Chicago, Illinois: American Academy of Sleep Medicine, 2001. Retrieved 16 May 2013. 1 2 3 4 5 Winocur E, Gavish A, Voikovitch M, Emodi-Perlman A, Eli I (2003). "Drugs and bruxism: a critical review". Journal of Orofacial Pain. 17 (2): 99–111. PMID 12836498. 1 2 3 Buescher JJ (November 2007). "Temporomandibular joint disorders". American Family Physician. 76 (10): 1477–82. PMID 18052012. ↑ Davies S, Gray RM (September 2001). "What is occlusion?". British Dental Journal. 191 (5): 235–8, 241–5. doi:10.1038/sj.bdj.4801151a. PMID 11575759. ↑ Mehra P; D'Innocenzo R (18 May 2015). Manual of Minor Oral Surgery for the General Dentist. John Wiley & Sons. p. 300. ISBN 978-1-118-93843-0. 1 2 3 4 5 Persaud R, Garas G, Silva S, Stamatoglou C, Chatrath P, Patel K (February 2013). "An evidence-based review of botulinum toxin (Botox) applications in non-cosmetic head and neck conditions". JRSM Short Reports. 4 (2): 10. doi:10.1177/2042533312472115. PMC 3591685 . PMID 23476731. ↑ "Bruxism Origin". dictionary.com. Retrieved 13 July 2015. ↑ Lobbezzo, F. "Bruxism defined and graded: an international consensus". 1 2 Nissani, M. (2000). "A Taste-Based Approach to the Prevention of Bruxism". Applied Psychophysiology and Biofeedback. 24, No. 1, pp. 43-54. ↑ "International Classification of Diseases – 10th revision". World Health Organization. Retrieved 18 May 2013. ↑ Jagger R (2008). "The effectiveness of occlusal splints for sleep bruxism". Evidence-based Dentistry. 9 (1): 23. doi:10.1038/sj.ebd.6400569. PMID 18364692. ↑ Hylander, William L.; Laskin, Daniel M.; Greene, Charles B. (2006). Temporomandibular disorders an evidence-based approach to diagnosis and treatment. Chicago: Quintessence Pub. pp. 377–90. ISBN 0-86715-447-0. ↑ Dao TT, Lavigne GJ (1998). "Oral splints: the crutches for temporomandibular disorders and bruxism?". Critical Reviews in Oral Biology and Medicine. 9 (3): 345–61. doi:10.1177/10454411980090030701. PMID 9715371. ↑ Widmalm SE (March 1999). "Use and abuse of bite splints". Compendium of Continuing Education in Dentistry. 20 (3): 249–54, 256, 258–9; quiz 260. PMID 11692335. ↑ Huynh N, Manzini C, Rompré PH, Lavigne GJ (October 2007). "Weighing the potential effectiveness of various treatments for sleep bruxism". Journal of the Canadian Dental Association. 73 (8): 727–30. PMID 17949541. ↑ van der Meulen MJ, Lobbezoo F, Naeije M (July 2000). "Behandeling van bruxisme. De psychologische benadering" [Role of the psychologist in the treatment of bruxism]. Nederlands Tijdschrift Voor Tandheelkunde (in Dutch). 107 (7): 297–300. PMID 11385786. 1 2 3 4 Machado, Eduardo; Machado, Patricia; Cunali, Paulo Afonso; Dal Fabbro, Cibele (2011). "Sleep bruxism: Therapeutic possibilities based in evidences" (PDF). Dental Press Journal of Orthodontics. 16 (2): 58–64. ↑ Behr, Michael; Hahnel, Sebastian; Faltermeier, Andreas; Bürgers, Ralf; Kolbeck, Carola; Handel, Gerhard; Proff, Peter. "The two main theories on dental bruxism" (PDF). Annals of Anatomy - Anatomischer Anzeiger. 194 (2): 216–219. doi:10.1016/j.aanat.2011.09.002. ↑ "Meaning of "to grit one's teeth" on thefreedictionary.com". Farlex, Inc. Retrieved 22 May 2013. ↑ Gill, PS; Chawla KK; Chawla S (Mar 2011). "Bruxism/bruxomania, causes and management". Indian Journal of Dental Sciences. 3 (1): 26. ↑ "Ecstasy on CESAR". Center for Substance Abuse Research (CESAR), at the University of Maryland at College Park. Retrieved 17 May 2013. ↑ Hamamoto, DT; Rhodus, NL (January 2009). "Methamphetamine abuse and dentistry.". Oral diseases. 15 (1): 27–37. doi:10.1111/j.1601-0825.2008.01459.x. PMID 18992021.